Fast ELISA kit now available: Boster is proud to announce the newest Picokine Fast ELISA kits. Now you can perform what used to be 4+ hour ELISA assay in under 1.5 hours. Available for Human TIMP-1 PicoKine™ Fast ELISA Kit and many others. 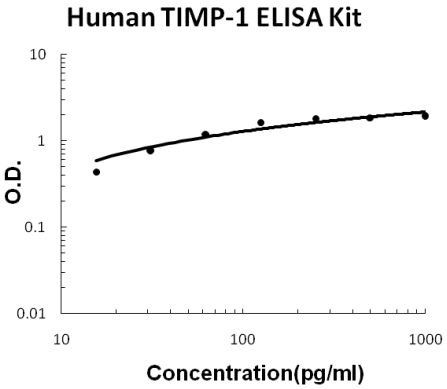 Sandwich High Sensitivity ELISA kit for Quantitative Detection of Human TIMP-1. 96wells/kit, with removable strips. Detected in rheumatoid synovial fluid (at protein level). .
Metalloproteinase inhibitor that functions by forming one to one complexes with target metalloproteinases, such as collagenases, and irreversibly inactivates them by binding to their catalytic zinc cofactor. Acts on MMP1, MMP2, MMP3, MMP7, MMP8, MMP9, MMP10, MMP11, MMP12, MMP13 and MMP16. Does not act on MMP14. Also functions as a growth factor that regulates cell differentiation, migration and cell death and activates cellular signaling cascades via CD63 and ITGB1. Plays a role in integrin signaling. Mediates erythropoiesis in vitro; but, unlike IL3, it is species-specific, stimulating the growth and differentiation of only human and murine erythroid progenitors. . The tissue inhibitor of metalloproteinases 1(TIMP1) is also called erythroid-potentiating activity(EPA). The X-linked gene for human TIMP1 is expressed in some but not all inactive X-containing somatic-cell hybrids, suggesting that this gene is either prone to reactivation or variable in its inactivation. Purified EPA specifically stimulates human and murine cells of the erythroid lineage, unlike murine interleukin-3(IL-3) which stimulates precursor cells from all haematopoietic lineages. TIMP1 is thought to play a regulatory role in connective tissues by forming inactive complexes with those metalloproteinases that are normally responsible for connective tissue turnover. The human gene encoding TIMP has been mapped to the X chromosome in the region Xp11.1-p11.4. The standard product used in this kit is natural TIMP-1 with the molecular mass of 22KDa. Deng Cl, Ling St, Liu Xq, Zhao Yj, Lv Yf. Exp Ther Med. 2015 Mar;9(3):992-998. Epub 2015 Jan 20. Decreased Expression Of Matrix Metalloproteinase-1 In The Maternal Umbilical Serum, Trophoblasts And Decidua Leads To Preeclampsia. Hopps E, Lo Presti R, Montana M, Noto D, Averna Mr, Caimi G. J Investig Med. 2013 Aug;61(6):978-83. Doi: 10.231/Jim.0B013E318294E9Da. Gelatinases And Their Tissue Inhibitors In A Group Of Subjects With Metabolic Syndrome.